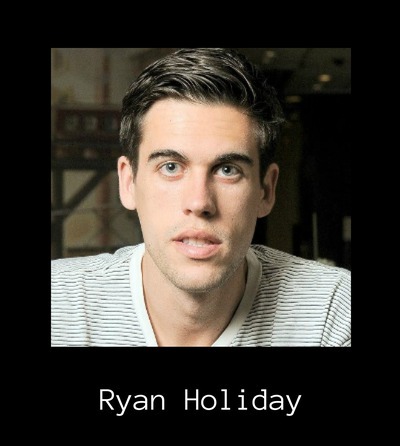 Ryan Holiday is a renowned media strategist and influential speaker and writer on self-awareness. After dropping out of college at 19 to apprentice under Robert Greene, author of The 48 Laws of Power, he went on to advise many bestselling authors and multi-platinum musicians. He is the director of marketing at American Apparel, where his campaigns have been used as case studies by Twitter, YouTube, and Google and written about in AdAge, Forbes, and Fast Company. A bestselling author, Ryan Holiday's first book, Trust Me I’m Lying: Confessions of a Media Manipulator, was a Wall Street Journal bestseller. 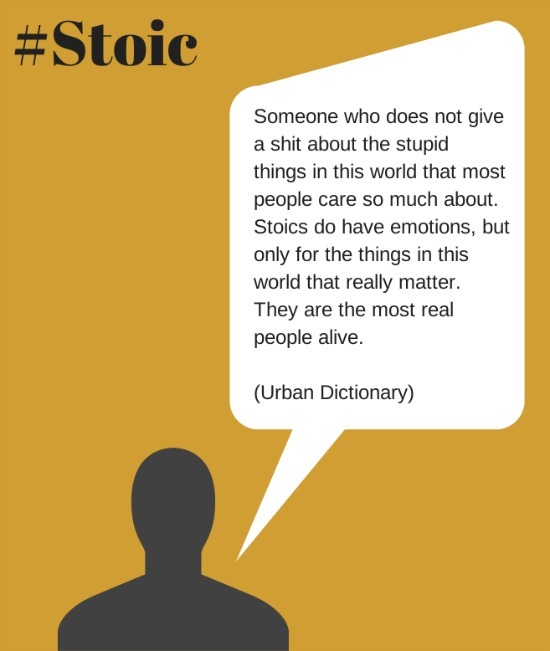 I love the fact that you champion the study and application of the ancient philosophy of Stoicism because its influence can clearly be seen in so many areas of modern psychology e.g. emotion, habit, cognition, perceptual bias, self-actualization etc. Could you briefly explain what Stoicism is? Stoicism is a philosophy that was popularized by the Greeks and Romans. The great Ancients Stoics like Seneca, Epictetus, and Marcus Aurelius never intended for their thoughts or writing to be published, so their work doesn’t have the puffing up that you’ll see when someone knows they’re writing for an audience. Among the three you find a businessman, a slave and an emperor (respectively) so it is this philosophy for success, adversity and everything in between. I like it because its a very practical set of principles that are repeated over again in different ways, and it doesn’t go into the theoretical realm that is only really useful to academics. I consider it a system that is designed to direct our actions and thoughts in an inherently unpredictable world. 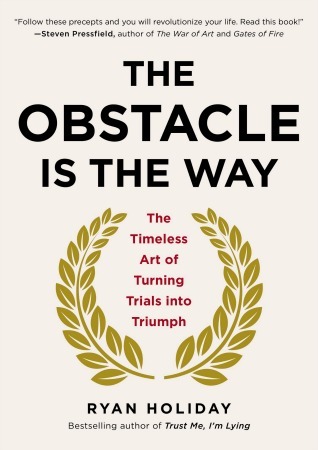 You're quoted as saying that stoicism is designed to be a set of practical exercises that help us with the problems that we have in our lives. Could you tell us about an instance when you've employed stoicism to help you out during a difficult time? I actually try to avoid this question because it's not about one instance but about constant application - someone cuts you off in traffic, you have trouble with an employee, you get writer's block, whatever, stoicism is there. But in my life, while I was waiting for this book to came out I was involved in a pretty horrific car accident. Later that week my house was ransacked, including the engagement ring I had purchased for my girlfriend. It was very much an opportunity for me to practice these principles, as I always had tried to. It could have been the worst thing that happened to me or just a thing that happened. I could have acted like everyone and everything had turned against me. But I used it as kind of a turning point in my life - valuing what’s important to me and reminding myself how fragile life is. You call The Meditations by Marcus Aurelius the greatest book ever written. Why is that? I’ve read Meditations countless times and have gone through tons of copies (you have to read the Hay’s translation). I usually always have one on me. I think it is the definitive text on self-discipline, personal ethics, humility, self-actualization and strength. Marcus Aurelius was the emperor of the Rome and was worshiped as a god while still living. He could basically do anything he wanted and had the known world at his fingertips. Instead he chose to try to live a life of virtue and honor, writing personal exhortations to himself at night a reminders of how to life a good life. If you read it and aren’t profoundly changed by it, it’s probably because as Aurelius says "what doesn’t transmit light creates its own darkness." In your new book you draw on the wisdom of iconic individuals who were all able to craft a life of profound meaning and purpose regardless of the obstacles placed in their way. If it were possible to sit down and talk with just one of these inspirational figures, who would it be and why? I’ve been very lucky in that I’ve been able to talk to and apprentice under two inspirational figures in my career. The first being Robert Greene, who taught me how to find great stories from history and write powerfully. The second is Dov Charney, the founder of American Apparel, who taught me everything I know about marketing. But if had to choose one person, it would probably be Marcus Aurelius, for the obvious reasons I said before. He was a such a humble and thoughtful person, yet he had an almost unfathomable amount of power. I’d love to talk to him about how he managed it all. In reviewing your book, Professor Nancy F. Koehn from Harvard Business School states that you offer up "a host of easy-to-use tactics that each of us can put to work to follow our dreams." Could you give us an example of one such tactic? 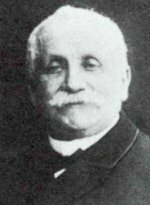 One tactic you can use is to practice what Nietzsche called Amor fati or "love of fate." Thomas Edison is a great example of someone who employed this attitude masterfully in his life. Later in his career his entire research and production facility burned to the ground. He should have been devastated, but instead he found his son at the scene of the fire and said "Go get your mother and all her friends, they’ll never see a fire like this again." What a reaction, right? Within about three weeks, the factory was partially back up and running. And within a month, its men were working two shifts a day churning out new products the world had never seen. We don’t always get to choose what happens to us, but we can always choose how feel about it. If you practice it, you’ll find it saves you a lot of the worry and anxiety that saps our energy and slows us down. 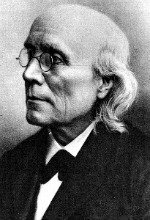 I was interested to learn that you recommend people read a self-help book written by Samuel Smiles that was first published in 1859. What does this book offer that modern self-help books don't? 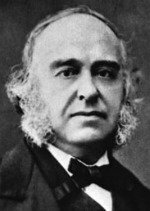 Samuel Smiles basically started the genre with the book Self Help. He wrote these really vivid examples in history of people that came to terms with their troubles and thrived despite them. The overall message of his book was basically, "Work very, very hard." Most modern self help has become bastardized over the years and the edge to it has been sanded down. Life isn’t supposed to be easy and I think a lot of self help doesn’t really address the difficulties we face in an authentic way. So I was definitely inspired by Smiles, because The Obstacle Is The Way contains real, practical strategies for people who want to do real things. I read that Stoics were renowned for writing down and carrying around their favorite maxims. Is it true you do the same but in the form of tattoos? Ha! Well, a tattoo at least. 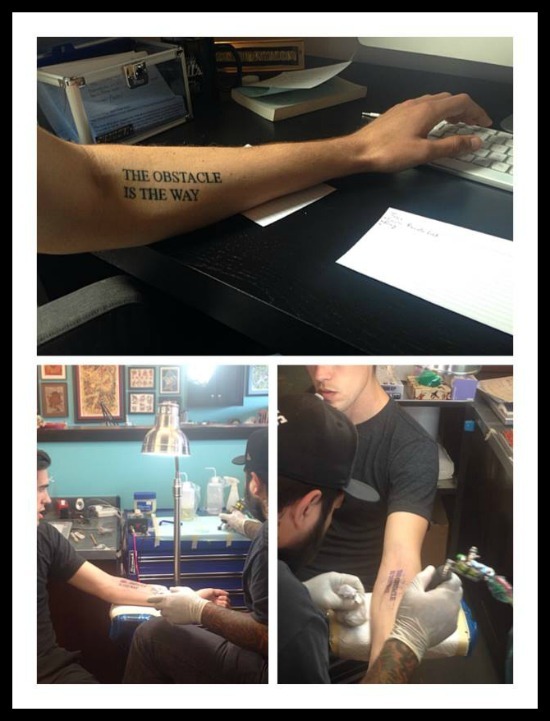 For people that don’t know, shortly before the book came out I got "The Obstacle Is The Way" tattooed on my forearm. Its there as a reminder when I’m writing or working, so its definitely in the spirit of the Ancient Stoics. Other reminders are framed and hung up in my office where I work. They’ve changed over time, but when something strikes me in the moment I never hesitate to post it because over time they’ve been very valuable to me. I also keep a commonplace book that contains important stories and quotes I pull from my reading and research that are inspiring. I’d say its been my single most important tool for allowing me to write three books in three years.